A professionally trained protection dog can enhance your home security, giving you peace of mind in the form of a loving, loyal companion. Better than a home security system, a protection dog springs into action immediately to neutralize any threat to your family or your property. Safer than a gun, a protection dog doesn’t miss its target and will never harm you or your family members. Every 13 seconds, a home gets broken into. Is your home safe? Are you and your family protected? Of course, to enjoy the maximum benefits a protection dog can offer, you need to make sure you choose the right canine for your family. 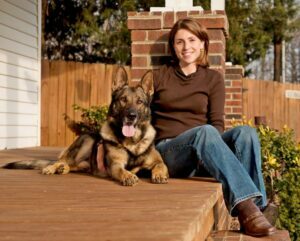 The simple fact is that most dogs – even guard dogs – just don’t have the right genetics or haven’t received the proper training to fulfill the very important role of protection dog. At Simanovich Protection Dogs, all of our German Shepherds come from the finest bloodlines in Germany and the Czech Republic, and all have received world-class training from our expert team of award-winning trainers. When you choose a protection dog from Simanovich Protection Dogs, you can rest easy knowing you’re getting a loyal companion trained to handle any situation that might arise. We have successfully delivered our dogs to Arizona residents for many years, and we look forward to helping you increase your safety with one of our four-legged security systems.